Chlorinated aromatic organic compounds are extremely toxic to the environment and cause cancer to the human body. Pentachlorophenol (PCP) is a hydrophobic and ionic organic compound that is employed as a production material in various industries. Although the Taiwanese government has banned the use of PCP for years, large PCP-contaminated areas remain in Southern Taiwan. Chemical oxidation, which has been proposed as a viable method for restoring PCP-contaminated areas, involves the use of micronanosize birnessite (δ-MnO2), which is a type of manganese oxide and a natural mineral in soil environments. 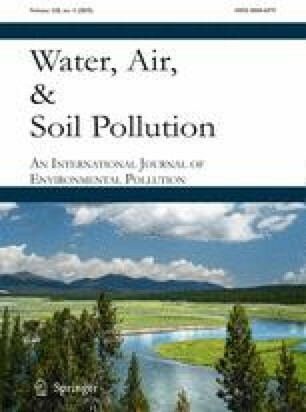 The goal of this study was to simulate the decontamination of the underlying soil of the PCP-contaminated areas, which is situated in anaerobic and lightless environment. Through the use of a self-developed gas release and absorption reaction flask, the oxidative mineral decarboxylation and dechlorination effects of δ-MnO2 on PCP in aerobic and anaerobic (with oxygen removed through the use of nitrogen) environments without light were investigated. Results indicated that adding δ-MnO2 facilitated the oxidative decarboxylation and dechlorination of PCP and the release of Cl− in an aerobic, lightless environment without microbial activity. In the anaerobic environment, the oxidative decarboxylation effect of δ-MnO2 on PCP decreased significantly, and the dechlorination effect was the primary reaction. Accordingly, adding δ-MnO2 inorganically destroys aromatic benzene and releases CO2 and Cl−. The molar ratio between CO2 and Cl− was calculated to assess the mechanisms of the distinct reaction systems. The parameters and data acquired from the experiment, which involved simulating the conditions of the contaminated areas, can be used in planning the on-site management of the PCP contamination; in particular, these parameters and data provide a reference for eliminating PCP from underlying soil—including groundwater-saturated layers.